It was a blast creating the wedding video for Kristy and Kurt at their beautiful wedding just outside of Tahoe at Mount Rose. Kristy and Kurt have such a fun sense of humor with each other, and are so genuinely caring for their family and friends—it created such a warm and enjoyable ceremony and reception for everyone. The views are stunning at Winters Creek, and it was the most impressive scenic backdrop to their ceremony and reception as everyone danced the night away. Kristy and Kurt, we are so grateful that you put your trust in us to create your wedding film for you. We were so honored to capture the day for you and we wish you nothing but the best happiness and love together for many, many years to come! Sorry, this film is for private viewing only! 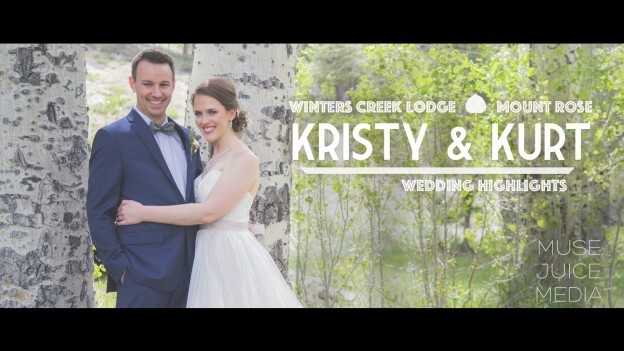 This entry was posted in Winters Creek Lodge, Mount Rose and tagged best tahoe wedding videographer, mount rose, mt rose, tahoe wedding video, tahoe wedding videographers, winters creek lodge, winters creek lodge wedding on June 30, 2016 by christa. There were so many reasons we were excited to film Jen and Tiffany’s wedding at Forest House Lodge in Forest Hill. For one, Jen’s wedding gift to Tiffany, was us! Videographers! As the story goes, Tiffany had been wanting videographers so badly, but Jen insisted it just wasn’t in their budget and she was going to have friends GoPro the wedding for them instead. Little did Tiffany know, Jen had hired us back in April! She revealed her surprise to Tiffany during their first look, we snuck up behind them so Tiffany would see us when she turned around. It was so much fun to be a part of the surprise for them! Another reason we were so excited to film for Jen and Tiffany, is by absolute perfect timing just the day before the Supreme Court granted marriage equality rights nationwide! Not only was it an exciting time for our country, for but for these ladies to get married just the day after, and for us to film for them… it was simply awesome and we were so happy to be a part of the magic! Jen and Tiffany, we want to thank you so much for having us there, we were so happy to be a part of your surprise and we hope you enjoy your wedding film for years to come! This entry was posted in Forest House Lodge, Gay Weddings Magazine and tagged forest hill, forest hill wedding, forest house lodge, forest house lodge wedding, gay wedding inspiration, gay wedding video, gay wedding videographer, last minute videographer, last minute wedding, lesbian wedding, lesbian wedding video, lesbian wedding videographer, lgbt videographer, lgbt wedding, should I get a videographer on July 13, 2015 by christa. Peter and Robin’s Northstar wedding was breathtaking! These two got married on top of a mountain surrounded by the natural beauty of North Lake Tahoe—what an amazing spot to tie the knot! Peter and Robin have such a great mellow and happy energy, you can’t help but love these two, you really can’t. I also have to admit, I’m not much of a crier… but, the speech Robin’s brother Ruel gave… I had the hardest time editing because I would get a lump in my throat every time! It was so sweet, and the whole day was like that, every single element in the day was gorgeous and purely good fun. Robin and Peter, we thank you so much for having us film for you. We wish you many, many years of amazing adventures and lots of laughs together! This entry was posted in Northstar at Tahoe and tagged lake tahoe wedding, lake tahoe wedding video, lake tahoe wedding videographer, lake tahoe wedding videography, last minute videographer, nature wedding, nature wedding video, nature wedding videographer, nature wedding videographers, nature wedding videography, northstar wedding, should I get a videographer, tahoe wedding, tahoe wedding videographer, tahoe wedding videographers, tahoe wedding videographylast minute wedding on July 3, 2015 by christa.